The news of a ‘7 year old boy’ gruesomely tortured and burned to death for stealing Garri broke yesterday (November 16, 2016) when a user on Twitter, @Adeyanjudeji, tweeted pictures about it and Linda Ikeji carried it on her blog. In a matter of hours, a video had surfaced to join the pictures and though I didn’t watch it, the pictures were enough to show people standing by as this little boy was beaten up, draped with a tyre and set ablaze; all by a mob of men and women frothing at the mouth with supposedly righteous indignation. It was later discovered that he was a full grown man as opposed to the little boy that was originally reported. This is not the first time mob ‘justice’ has happened in Nigeria or Africa even. In fact, this is one of the many instances that have been in the news so far this year. Children, adults, groups and even whole communities are set upon by mobs and burned to ground; with wanton disregard for human life and humanity. These ones are the deeply uneducated yet easily offended members of a religious group. They are machete-happy and cannot wait to cut down and burn any and every one who dares blaspheme their precious gods. They are found in Traditional religion, Christianity and Islam. Depending on where you are in the country, you don’t want to be caught by these men. In Central African Republic, it is almost common place to hear of Christian mobs beating and killing Muslims. In Nigeria, we are still reeling from the mob killings in Zamfara, Niger, Abuja and Kano by Muslim Zealots. I wrote extensively about this in my post, ‘Attacking Christians?’ In fact, killers of Bridget Agbahime were just released by the Kano State Attorney General few days go. These groups are always on ground to deliver jungle justice to anyone who steals; whether that theft is money or Garri. Do you remember the gruesome Ejigbo pepper incident where a woman and her daughters were stripped down and rubbed with alligator pepper mixed with gin for allegedly stealing pepper? With the culprits even going as far inserting this mixture in the women’s vaginas and using sticks to ‘stir’ it in? Or the gruesome killing of four buys in what has been called the ALUU4 killings? Or the many cases of alleged thieves been beaten and burned to death across the country? In their view, killing these 'thieves' serves as a deterrent for others and in a way, a strike back at the number of terrible robbery attacks they themselves have had to face. This is especially true for South Africa where citizens of the country targeted and killed immigrants and visitors for allegedly taking their jobs. 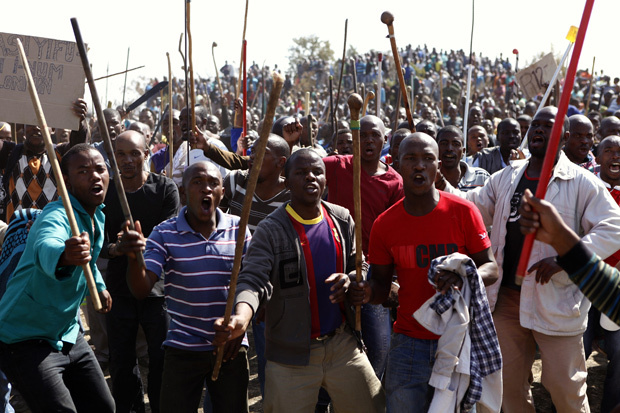 From Johannesburg to Soweto, these rampaging crowds went about beating and killing fellow Africans in one of the worst xenophobic attacks in recent time. No one was brought to justice and even the South African Zulu king, Godwill Zwelithi, is still enjoying himself in his kingdom, even though his hateful speech about foreigners stirred the xenophobic attacks and his silence intensified it. Many governments in Africa are directly responsible for the deaths of their citizens through organized mob action. Look at what is happening in Nigeria. Murdering herdsmen go on rampage in many towns across the country and almost nothing is ever done. Southern Kaduna is still broiling from the 31 people that were just killed two days ago. Many residents of Benue, Jos, Ekiti, Enugu and Taraba are still mourning the loss of their relatives. And what does the government do? Almost nothing! The government is complicit in the deaths of these Nigerians. On the other hand, bandits go into communities in Northern Nigeria (Zamfara, Sokoto, Katsina) and kill at will. Cultists in the Southern part of the country (Akwa Ibom, Bayelsa, Cross River, Rivers etc) act like nothing can be done to them. And what happens? Nothing! Absolutely nothing! All we have are a group of elected officials who always ask for understanding when these acts occur. When these killings begin to affect them or people like them, you then see a show of force. Even more so is the direct killings of Shiite Muslims by the government’s mob; the army. Hundreds of Shiites have been killed and hastily buried because they are dissenting voices from what is popular and accepted as the norm. And even though I do not agree with the beliefs of the Shiites, I do not think it is an excuse to kill them. People who protest peacefully are set upon by angry crowds and killed in the very glare of the army. You begin to wonder which minority is next on the list. Oh you didn’t know? We are all complicit in these murders! You and I are part of the problem. We contribute to the mob killings by being silent. Oh yes! We stand and watch when people are killed and we even take out our phones for our favorite pastime; recording the moment. If there are no pictures, it didn’t happen right? We talk about it in anger on social media, spewing all manner of self-righteous indignation at the horrific way someone was killed and when it stops being a trending topic, we forget about it until the next incident happens. We come out en masse for rallies to protest increase in fuel price hike but we don’t do the same to demand that our government protects the lives of EVERY NIGERIAN AND AFRICAN. Well, who really cares about Nigerian (or African) lives? After all, it doesn’t affect us now, does it? We share pictures and videos of gruesome killings in our moment of shame and then we move on to the next, less disturbing, trending topic. And some of us, secretly, in our inner most spirit and mind, are glad that these people are lynched because it makes us feel safer and promotes our beliefs and ideologies. After all, you didn’t kill the person yourself. You just believe in your views, right? Admit it; even to just yourselves. Do you know what all these say about us? We are all a group of immoral, indecent and vile murderers! Each of us, every one of us! And guess what? We should be ashamed. We should be so ashamed that we no longer pretend to have decency, that we are able to look at a man who steals Garri and say the only punishment deserving of the crime is death by mob violence. I have never been so ashamed of being Nigerian. I have never been so ashamed! Jungle justice and mob violence has to stop! And this is where we must come in. When a group of people attack a person to lynch them, the greater number of onlookers should stand to protect the individual. If we had any decency and morality in us, that is what should have been done for that all the victims we have heard about. The attackers are usually smaller than those just standing there and if we all work towards protecting one another, these attackers wouldn’t dare brazenly kill people in the name of justice. And our justice system has to work. Mob killers shouldn’t be let off the hook by State Attorneys even after video evidence of a crime is tendered before the courts. And best of all, we need to stay woke! We shouldn’t talk about issues only because it is trending. We need to constantly speak to our government, our systems and ourselves and shirk our murderous proclivities before we move from watching people beat and burn others, to taking lives ourselves. There is no better time to hope and pray because you never know when you might fall victim to a system you helped create.